The most prolific archetype within the Star Wars Universe is either the Sith Lord or the noble, yet tragic Jedi. Nearly every story within the Star Wars sagas, both canon and expanded universe, has at least one Jedi in it. The Jedi that are so often depicted are often cut from the same mold: A figure who has experienced great personal tragedy, yet continues to fight for truth, justice and the American… wait. Rewind. They continue to fight for truth and justice, even though they could easily turn into a revenge-seeking wrecking ball. Satele Shan is just one of these do-gooder types. There are a few characters that are thrust to the forefront of the TOR story. Satele is one of them. She’s depicted in two of the three trailers that gave us a glimpse into the world of TOR. 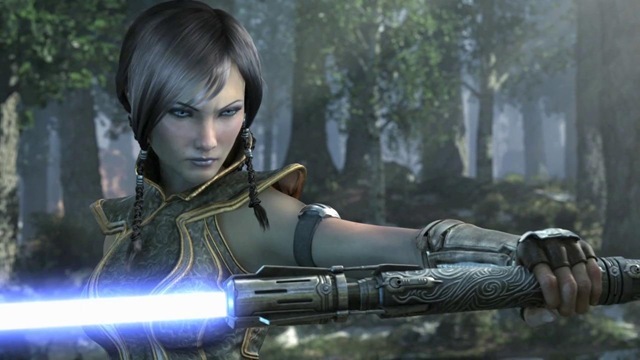 It made her the star Jedi prior to the game’s launch. And what a leading lady! BioWare was definitely banking on the fanboys and their desire to have a bonafide hottie take the helm for the good guys. In talking with several players that I know, many comments, which I won’t repeat here, have been made regarding Miss Shan. She doesn’t have the following yet, but it’s growing, and soon she may rank up there with the likes of Tomb Raider’s Lara Croft and Bloodrayne, to name just a couple. 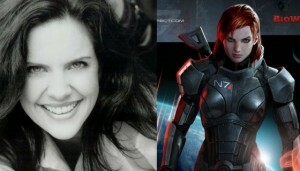 First, we have to give credit to the lovely Jennifer Hale who brings the character of Satele to life through her wonderful voice acting. Jennifer is no slouch in the voice acting department. BioWare has repeatedly tapped this songbird for her voice talents in more than one of their video game titles: Mass Effect and ST: KoToR. Her credits also include Disney animated movies, The Powerpuff Girls movies, and Scooby Doo animated films. Miss Hale’s credits also include voice work for television and a singing career. Pretty busy for the head of the Jedi Council. Satele, or at least the character in the game, is a lore-rich character all in herself. From the young padawan/knight all the way up to her ascension to Grand Master and head of the Jedi Council, Satele has her story tightly intertwined with the general pre-TOR story. This woman is a Jedi and a mother, a teacher and a student, and all-in-all, a person with flaws and weaknesses. But she shines through all that to attempt to be a beacon of hope for a dogged Republic on the verge of collapse. Satele is a direct descendent of Bastila Shan, famed from the KoToR era, and the goodguy/bad guy, Revan. Given that lineage, you have to figure that this girl oozes the Force. How this will come to play with any further developments concerning Revan in TOR will have to be seen. Together, Satele and her ancestor, Revan, have the potential to be a huge problem for the Sith Empire. I think the pure awesome-ness of these two fighting side-by-side would be nothing short of spectacular. In my initial quest to find some pics to display for this episode, I did like any self respected geek would do: I used Google. 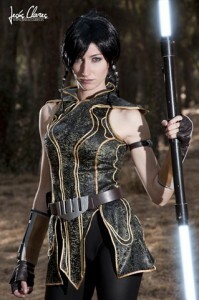 Just for fun, I typed in “Satele Shan Cosplay” to see what I could find. Now, I did this not only to find possible pics of Satele, but also because I often times work on an old Star Wars D6 RPG site with my close friend, where we try to add custom content to a long-dead game that we still enjoy playing. With that, I do a lot of photoshop-style digital art for characters and whatnot. Imagine my surprise when I came across this awesome Cosplayer, Nebulaluben. 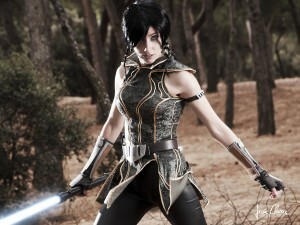 This gal has Satele nailed down… I mean, if I was casting a Star Wars: The Old Republic movie, I’d have to consider her. Obviously, a whole lot of work went into creating such an awesome costume. The hair and the costume are spot on. Even Nelubaluben’s physical looks are totally right for Satele. I’d almost think that BioWare modeled the character after her, but I know it’s the other way around. If you ever check out Deviant Art, then you should definitely pay her a visit and compliment her on a job well done. Her hard work is very visible and very much appreciated. I’m going to keep this short and hold back for the big lore content for next week, in part 2. Hopefully, my computer doesn’t develop a severe case of the flu on me again. But this week has been a good test and I’m hoping things are on the up and up. Tune-in next week as we look into Satele’s backstory. Until then, enjoy these awesome pictures.